She is a girl whose memories were taken from her, and as she gradually gains them back, more of her character is revealed. Sakura-hime is said to be favored by the gods and as such, is extremely lucky. This luck is pushed to the point where there was a time when the group had arrived at a new world and would have Sakura gamble to earn their living expenses. This amazing luck is also what has kept her alive until now. Though Sakura-hime is placed in a situation where she is supposedly a damsel in distress, time after time, she has proven that she is not. 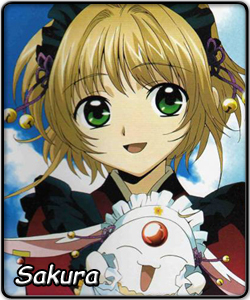 She tries her best not to rely on Syaoran, Kurogane and Fay, even doing her best to help them. She has also proven that in a "kill or be killed" situation, she has the will to kill. She also never gives up. Even when her body is injured and she can barely stand, she perseveres to accomplish her objective. She is also said to have a smile that melts the coldest hearts. This smile was what opened up Syaoran during their early childhood. Her intuition is also strong, as she can easily understand other's feelings. Her trust in Fay, even after knowing that he was lying, broke Fay's shell that was keeping him from being close to the others, and eventually allowing him to truly smile. Sakura-hime has many powers, most of which are unknown. She has the power to see the future in dreams, but since she hasn't mastered it yet, she only sees fragments of the future. She is able talk to non-living things as shown when she helped a tornado trapped due to the power of her feather, and she can even talk to the dead. At the beginning of the series, she is often half-asleep, having many notably cute sleepy faces. In the manga, Sakura exhibits funny behaviors while drunk, such as pretending to be a cat while wandering around the room, only saying meow. She also moves around a lot while sleeping.